I have been working on the Hortus Conclusus project since 2009. One of the works that emerged from this project is a codex, a book. Not an ordinary book, in the sense of a classical collection of texts and/or images, but an autonomous work of art in the form of a book. Philosopher, emeritus principal lecturer of the department of Philosophy of the University of Leiden, and published author (a.o. Vantilt, Boom, SUN), dr. Gerard Visser, has written the text 'minding emptiness' for this codex. In his scientific work 'acquiescence' (publisher SUN, 2008), he applies the 'mood/mind' ('gemoed' in Dutch doesn't have an exact synonym in English) and the 'letting be' in the writings of Meister Eckhart to the contemporary culture of rationality and experience. In this I saw a fascinating connection between Gerard's thinking and my project Hortus Conclusus. The emptiness that Meister Eckhart seeks and appreciates, can - in my view - enter a relationship with the open space in imagination, from which my project starts. 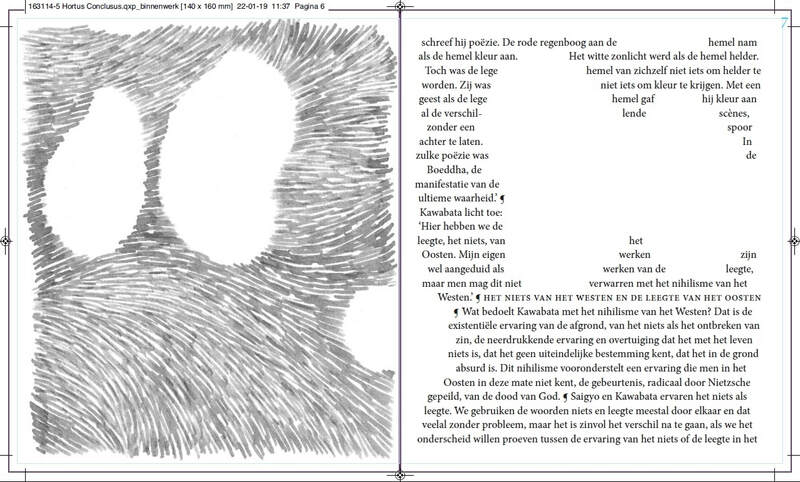 The text by Gerard Visser forms, together with elements from earlier work that came into being in this project, the material for the design of the codex. The concept, the text and the design together, form the concrete content of the codex. Kjeld de Ruyter, Puntspatie Amsterdam, is the graphic designer of the codex, and was financed by crowdfunding via www.voordekunst.nl. Print and binding is done by Ivo Sikkema, Ruparo Amsterdam. At the moment we are looking for patronage to finance the print. If you want to become a patron too -by the donation of any amount, or by the prepayment of one or more pre-ordered copies - please contact me by using the contact details or the contact form on the page 'contact' on this website. LE 23 + 2 AP; the text in the codex is in Dutch.